I was in the mood to make more Girly Girls cards w/ the Fabrianos after making this Cinderella card so late one night I did up 5 more w/ all the new Inky Antics stamps I got for my birthday. 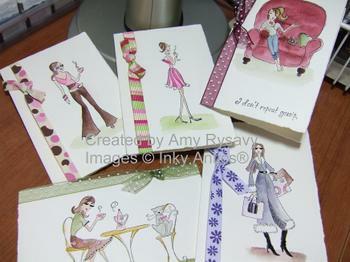 I stamped all of them w/ Black Stazon and watercolored them in w/ re-inkers and my AquaPainter. I then tied various ribbons (solid w/ dots and striped ribbons are Maya Road (got them from my LSS), flower ribbon is from Michaels, burgandy polka dot is May Arts from StarLitStudio, and olive polka dot is from Jacksonbelle Embellishments) and used my Sakura Stardust pen and Black Glaze pen here and there for a little added "bling". I will upload each individual picture into my Inky Antics album ------> so y'all can get a closer look if you want! Scroll down on the right to get to it. I'm still getting the hang of this new camera - it's completely different and takes some getting used to!! I made this some time ago for a good friend and had it sitting in my files on the computer for a few weeks now. So thankfully I had this card on file to share w/ y'all till I can get the new camera. 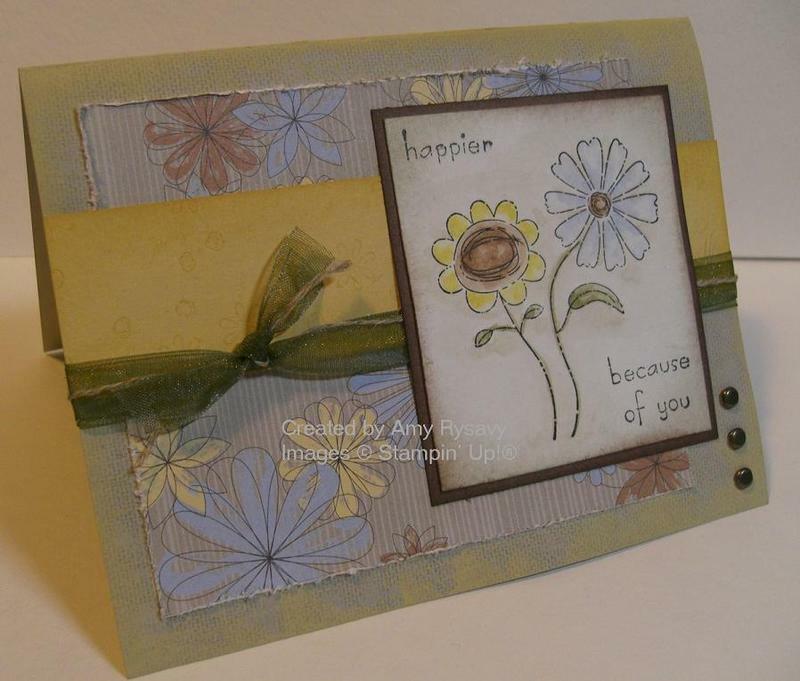 The colors I used were taken from the Spring Showers Designer Series paper. I cut a piece of it and distressed the edges before adhering it to the card base (which was stamped w/ Linen using Sahara Sand ink and). I also DTP'd (Direct to Paper) the card base edges w/ So Saffron Ink (that I heat set to dry faster). 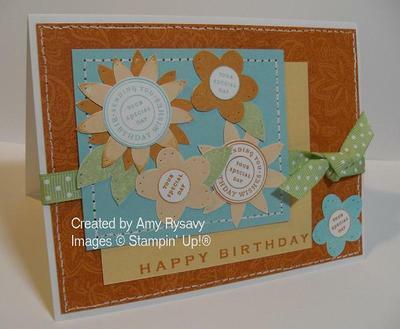 I stamped the So Saffron CS strip w/ the small flower images stamp and sponged the edges. After gluing it to the card I tied on Olive Organdy and Linen thread. For the main image I first stamped the flowers using Black Stazon on Watercolor Paper and watercoloring them using the Watercolor Wonder Crayons and my AquaPainter. Once it was all dry (using the heat tool to speed up the process of course) I then inked up only the 'happier' and stamped that on the top, cleaned it off *really* well (and tested it on scratch paper to make sure it wouldn't leave a mark) and then stamped the rest of the sentiment on the bottom. **Note - when stamping onto paper that has been watercolored make *doubly* sure that the paper is *completely* dry otherwise the images could run/smear and ruin the whole piece. I then sponged the edges of the watercolor paper w/ Sahara Sand ink and matted it on Close to Cocoa CS and adhered it to the card. I added 3 vintage brads to the bottom right to complete the look and that's it!! SETS: Because of You, Linen. CS: Sahara Sane, So Saffron, Close to Cocoa, Watercolor Paper, Spring Showers DS Paper. INK: Sahara Sand, So Saffron Craft, Black Stazon. ACCESSORIES: SU Cutter Kit, Watercolor Wonder Crayons, AquaPainter, Olive Organdy, Linen Thread, Vintage Brads, Sponge Daubers. I haven't had much time lately to do a lot of stamping lately:o( but I HAD to use one of my new Inky Antics stamps and a Fabriano Medioevalis card. I got a pack of 25 of them (with envelopes) from StarLitStudio. Until you see them for yourself a picture on a computer screen just doesn't do them justice!! They are a really thick watercolor paper and are scored down the middle so they fold easily. The envelopes are also a heavier weight so they make a really gorgeous card!! 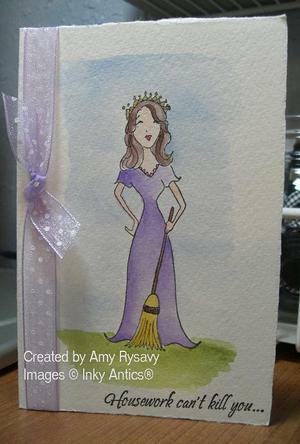 So I stamped Cinderella onto the card using Black Stazon and then watercolored her in w/ re-inkers (all SU) and an AquaPainter. Once it was dry I inked up the first part of the sentiment and stamped it on the front of the card. I then cleaned the stamp *really* well and tested it on scratch paper (to make sure it was clean) and then inked up the bottom part of the sentiment and stamped it on the inside. Inside it says: "but why take the chance?" I added some glitter w/ a Sakura Stardust pen (also from StarLitStudio - I get all the best goodies from her!!) to her crown and tied some polka-dot organdy ribbon (from Michaels) around the card and that's it!! STAMPS: Inky Antics. PAPER: Fabriano Medioevalis folded reply card. INK: Black Stazon, SU re-inkers: Certainly Celery, Bashful Blue, Lavender Lace, Blush Blossom, So Saffron, Close to Cocoa, Regal Rose. ACCESSORIES: Organdy Ribbon, Sakura Stardust Pen. I gotta admit I'm not all that happy w/ this card. I was trying out this week's SCS Color Challenge and the colors just weren't workin for me this time around!! I pulled out my brand spanking new Bodacious Bouquet set w/ matching Classy Brass template and went to work (had to use the template for this week's Ways To Use It Challenge) - this set has been sitting here for a few *weeks* now just begging to be inked up! 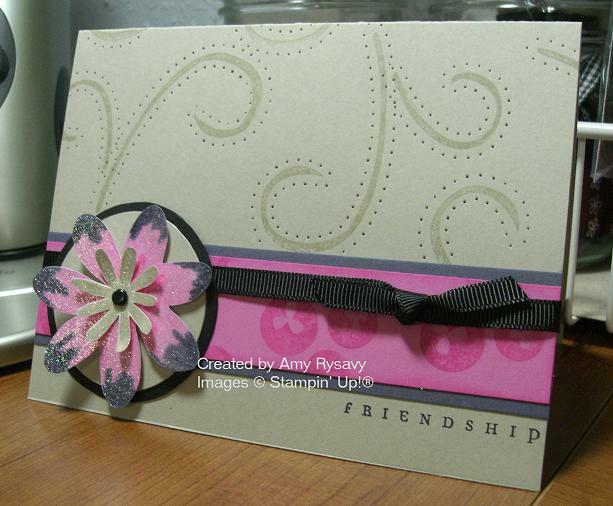 The flower I stamped using markers and a blender pen for the Vintage Violet. Once it was stamped I covered it w/ VersaMark and embossed it w/ Iridescent Ice EP and cut it out. 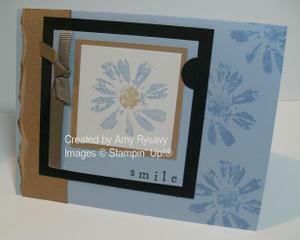 I stamped the center flower w/ Sahara Sand and did the same thing then connected them w/ a black brad. 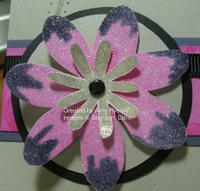 The circles were made w/ my Coluzzle and I adhered the flower to them w/ a dimensional. I then stamped the flourish on the card base and used the Classy Brass Template to pierce holes around each one. Once I got the strips of CS and ribbon on the card I inked up just the 'Friendship' part of the stamp (from SU's Take Three set) and stamped it directly under the strips of CS - I totally eyeballed it and AM proud to say I got it straight the first time LOL! (a good thing b/c I wasn't about to re-do the whole card base a second time!!). SETS: Bodacious Bouquet, Take Three. CS: Whisper White, Sahara Sand, Pixie Pink, Vintage Violet, Basic Black. INK: Sahara Sand, Pixie Pink, Vintage Violet, VersaMarker, Basic Black. ACCESSORIES: Iridescent Ice EP, Vintage Brads, Dimensionals, Coluzzle, Black Grosgrain, Bodacious Bouquet Classy Brass Template, Paper Piercer, Sponge Dauber. 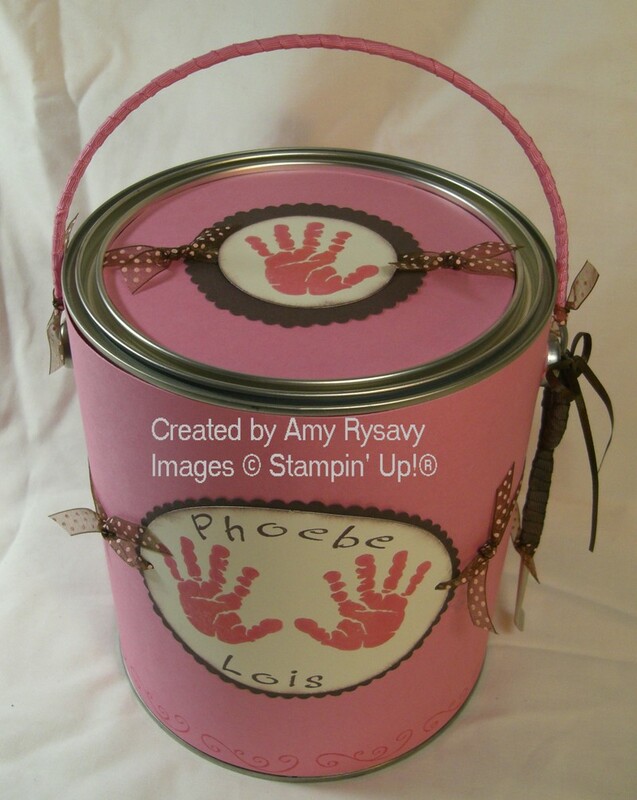 So like I said I went to a baby shower Monday night (you can see the card I made here) and I did another paint can to put the gifts in. I kept it rather simple as I made it a few hours before the shower - *and* I took pictures at each step so I could share it w/ y'all here! I hope this helps someone!! 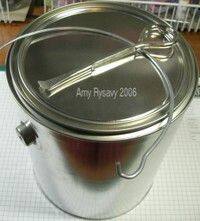 You can buy *clean* empty paint cans in most large hardware stores - I got mine at Home Depot. I know other ppl have been able to order them through their local HW stores (tho I *think* you have to order a large amount to get a good price). They're usually in the paint section - I found mine pushed back on a shelf and covered w/ dust - there weren't very many and I ended up buying out what all they had on hand! The cans come w/ a lid and a handle (not attached). I was able to get the opener for free from my local HW store (the ones at Home Depot have those ugly orange plastic handles - I prefer these kinds). **Make sure the can is *clean* and wipe off any dust/residue for the CS/Paper to be able to stick. **I don't have a template for this - I just do my own thing (I've actually NEVER used a real template for anything - I just go by the seat of my pants!! LOL). I'm sure if you did a search on SCS you could find one - however I find it's just as easy to do w/out. I took a sheet of CS and trimmed along the long side (so it ended up being about 11" x 7 3/8") so it would fit the paint can. 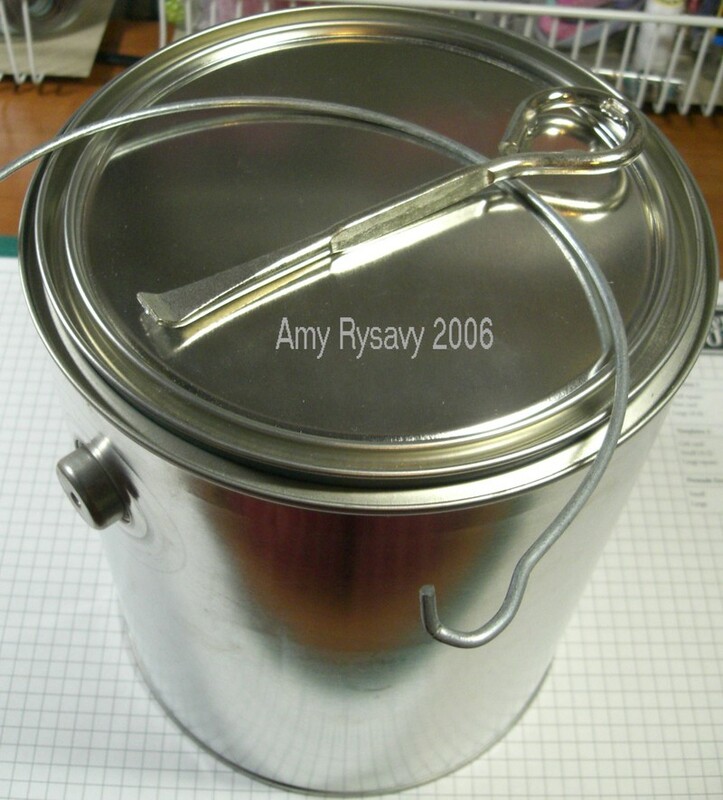 I then held the CS against the can and pressed w/ my fingers where the bumps for the handle goes (I've also done it where I marked it w/ a pencil - either way works). Once I have a good idea then I either use a circle punch or my Coluzzle to cut out the area where the handle goes. I *never* get it perfect the first try - I punch/cut then hold it back up to the can, then keep punching/cutting until the "notches" are far enough along in the CS that it sits flat against the can. Once I have the cuts the way I want I can stamp the CS. Once I have the first piece stuck on I do the same thing for the back piece. I usually trim a little off the sides of the second piece so that the "seams" are even w/ the handles. To adhere the CS I use sticky strip (red liner tape) on the ends and a SU Glue Stick in the middle. This makes it stick wonderfully!! The lid is a little tricky. 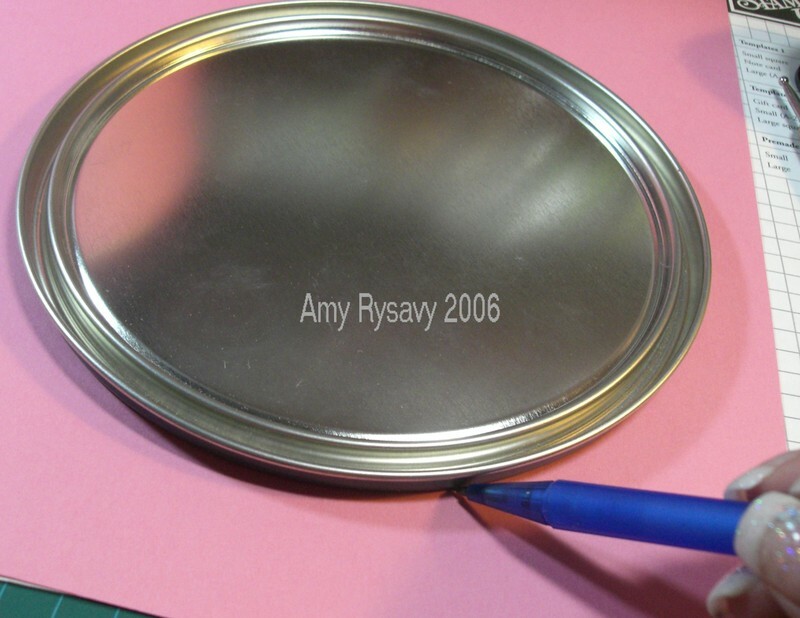 Unless you have a larger circle cutter (or the big Coluzzle circle template - the one that comes in the Coluzzle starter kit isn't big enough) it's hard to get a big enough circle of CS to fit the lid. The handle I covered it w/ Sticky Strip - I just ran it along the handle and pressed it down and the red liner popped up on it's own - took just a few seconds. I then wrapped it w/ ribbon (as opposed to tying tons of pieces of ribbon on it). 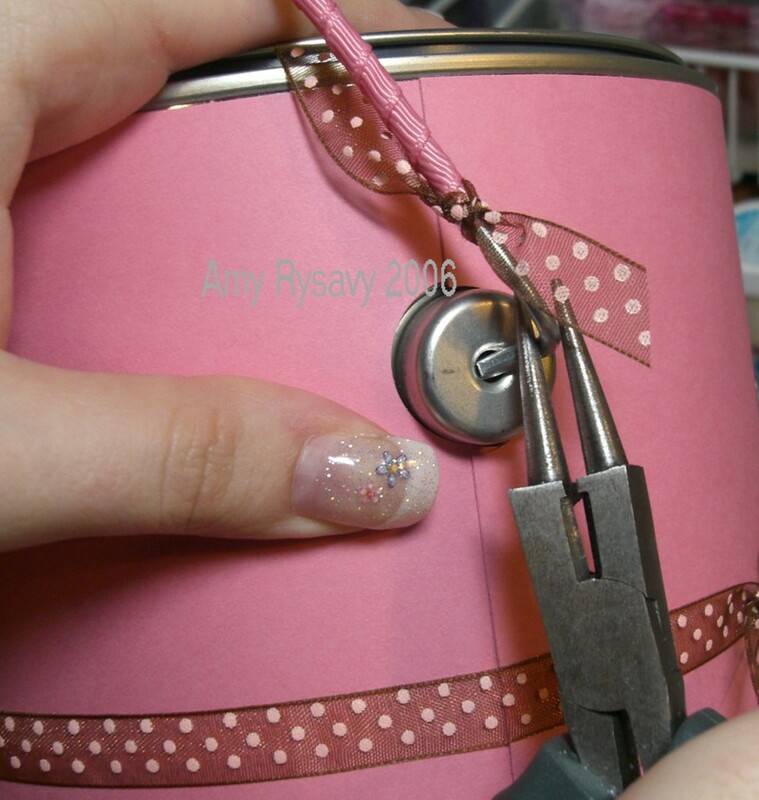 I did the same thing w/ the opener - covered it w/ sticky strip and wrapped it w/ ribbon. Getting the handle on the can is a little tricky. The first half goes in easily - but the second doesn't b/c of the way it's shaped. Use a pair of pliers and just ever-so-slightly bend the end of the handle so that it slips into the hole - doing it this way is a snap!! Like I said I kept it rather simple. I stamped the hands from I'm Here w/ Regal Rose Craft Ink and embossed them w/ Glassy Glaze EP. I then used the oval Coluzzle to cut them out (easier to cut *after* I've stamped instead of trying to line up the hands properly on an oval shape). 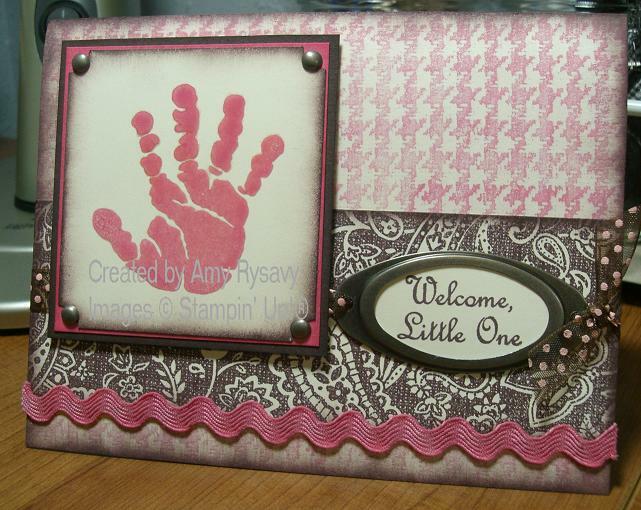 I then stamped the baby's name w/ the Brushstroke Alpha and sponged the edges. I matted it on Choc Chip CS and cut that out w/ scallop scissors. The brown and pink polka dot organdy is from Jacksonbelle's e-bay store. For the top I did the same thing - stamped and embossed the hand, then cut out w/ the circle coluzzle, matted it on Choc Chip and cut w/ scallop scissors. I stuck the Regal Rose CS (after I added the ribbon and whatnot) to the lid the same way I did to the can - sticky strip here and there and a SU Glue Stick applied liberally!). The flourish along the bottom of the can is from SU's Sweet Shapes set. 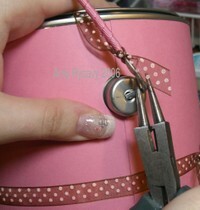 The opener is tied to the can w/ a bit of ribbon and easy to take off to actually open the can. Anyone else totally addicted??? Tim and I watch it *every* Wednesday - it's our date night LOL!! 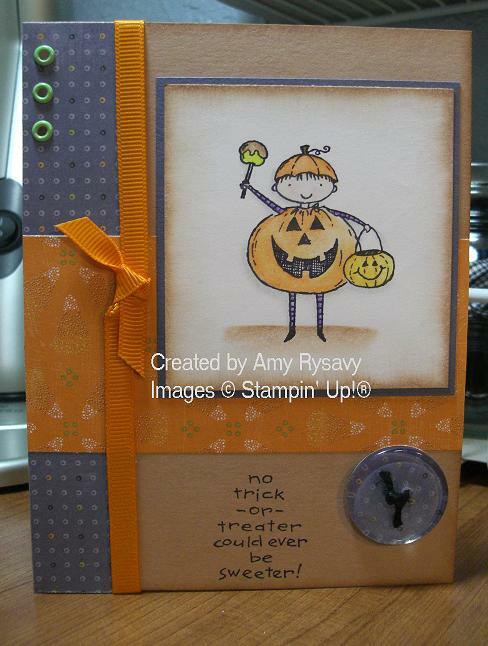 #1 - Congrats to Dale Anne - her name was picked from the comments on my Sweet Little Pumpkin Card! So send me your mailing addy Dale Anne and I'll get that card sent out to you ASAP!! #2 - Did you notice??? 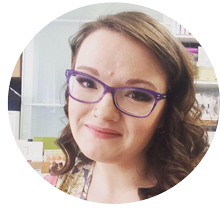 I've surpassed 100,000 page views on my blog!!! WOW!!!!!! That totally blows my mind!! I *never* thought it would get this far this fast!! #3 - I'm also #18 in the Stamping Top 50!!! That's ALL thanks to you guys!! #6 - I am WAY behind on e-mails and PM's - sorry!!! If there's something you need a reply on ASAP please send me another e-mail and I'll get back to you as quick as I can. I have a TON of things going on right now (all *good* things thankfully!) and things like e-mail (and housework *wink*) are falling a little behind. I got a couple of really nice birthday packages and cards and all those stamps are from Inky Antics - my Dad got them for me for my b-day and they *just* got here!! Yippee!!! I can't wait to ink those babies up!! 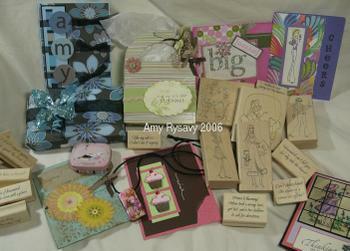 I will be uploading the individual gifts and cards to my SCS RAK gallery so that I can properly thank all the senders!! #8 - A HUGE HUGE Thank You to EVERYONE who sent me gifts/cards/e-mails/PM's etc for my birthday!! You guys (along w/ my family of course) made this the BESTEST birthday ever!!! My name's on the homepage! LOL - You can see it here. My third SCS tutorial is up - some of you will remember my Photo Corner tutorial from a couple of months ago on here. Now it's on SCS too! You can see it here. I went to a baby shower last night and this was the card I made for thenew mom. I also made a matching paint can but that will be another post. I put a lot into this card and was so pleased w/ how it turned out! I stamped the hand w/ craft ink and embossed it w/ Glassy Glaze EP then notched the corners w/ the Ticket Corner Punch and sponged the edges. The brads are from the Pewter Hodgepodge Hardware. The Houndstooth (retired) BG was stamped on the card base w/ craft ink and I sponged the card edges. I used Paisley (of course) on the Very Vanilla CS and sponged those edges too (I went a little sponge-crazy on this card - going for the shabby chic look). The sentiment I had to use the stamp-a-ma-jig and stamp twice as it's spaced too far apart to fit in the oval. 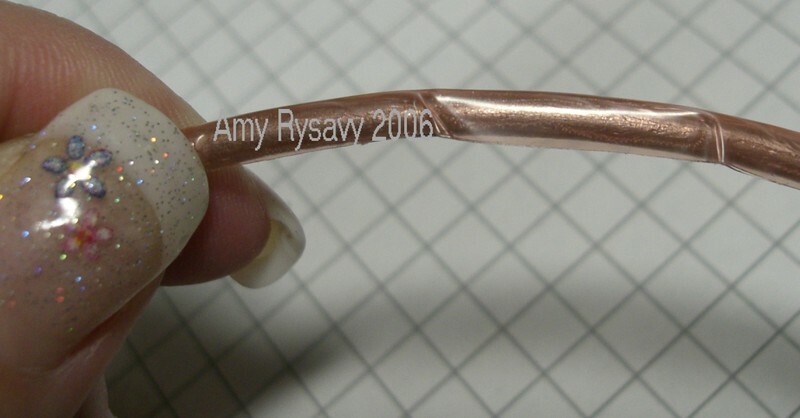 Once I stamped it I punched it out and adhered it inside the large oval HP Hardware. The ribbon I got from Jacksonbelle - it's brown organdy w/ *pink* polka dots!! SO cool!! The May Arts ric rac I got from StarLitStudio. It's actually a light pink but I wanted it Rose - so I pressed it into a *CRAFT* Regal Rose pad (wearing gloves) until it was fully saturated then placed it on paper towel and sprayed it w/ water (otherwise it would never fully dry as the ink is so thick) and pressed it in the paper towel. I then heat set it w/ my heat tool and voila!! Regal Rose RicRac!! It worked perfectly and I think it was b/c the ric rac is so tightly woven - I don't think this method would work so well on other types of ribbon (like regular grosgrain). I adhered the main image to the card w/ dimensionals and that was it! SETS: I'm Here, Welcome Little One (retired), Houndstooth (retired), Paisley. CS: Very Vanilla, Chocolate Chip, Regal Rose. INK: Regal Rose Craft, Choc Chip. ACCESSORIES: Glassy Glaze EP, Pewter HP Hardware, Ticket Corner Punch, Ribbon, Sponge Daubers, Dimensionals, Large Oval Punch. Isn't he just the sweetest little thing??? This is the first chance I've had to ink it up and I *HAD* to use this little guy - I think he's the cutest stamp in the whole set! I stamped him w/ Basic Black on Whisper White CS and colored him in w/ Prismacolors and Gamsol. I then sponged the edges w/ Creamy Caramel ink. I cute a piece of the violet Halloween Night paper and adhered it to the back of a clear button (from SU) using Crystal Effects and once it was dry I trimmed it close and tied on a little black hemp. ETA - I just applied a dot of the CE to the paper and pressed the button firmly to the paper and wiped away the excess around the edges. The rest of the card was simple to put together and only took a few minutes. The color combo wasn't what I was originally going for but in the end it turned out alright!! SETS: Sweeter Treaters. CS: Whisper White, Vintage Violet, Creamy Caramel, Halloween Night DS Paper. INK: Basic Black, Creamy Caramel. ACCESSORIES: BB II Eyelets, Clear Button, Black Hemp, Crystal Effects, Tangerine Ribbon. I made this really quick yesterday to give to a friend today. I've seen several examples on SCS using Circle of Friendship as the flower center - so this idea wasn't originally mine. The color combo was a total going-by-the-seat-of-the-pants thing - I had Apricot Appeal on my mind, then wanted Pumpkin Pie. I felt it needed more color so I grabbed Cool Caribbean and Certainly Celery too - I wasn't sure if it all would work but I guess it did. 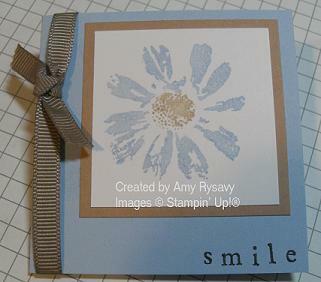 I stamped the flowers from Petal Pushers onto Whisper White CS and cut them all out. I then stamped several images w/ the birthday stamp from Circle of Friendship. 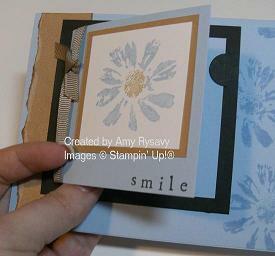 The 1/2" circle punch fits *perfectly* in the middle of those stamps - so I punched out a few. 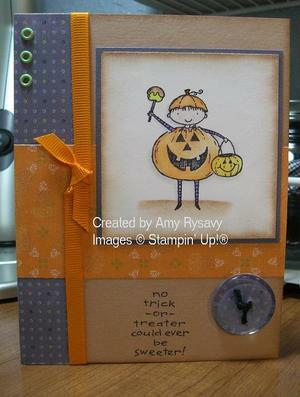 I stamped the Pumpkin Pie CS w/ Paisley (a card is never complete w/out it ya know! LOL) and faux stitched around the edges of it and the Cool Caribbean CS. The ribbon I picked up at Michaels a long time ago - I really LOVE the color of it! Once I got the card put together I felt it was missing something - so I pierced all the petals and leaves - it did help! SETS: Petal Pushers, Circle of Friendship, Paisley. CS: Whisper White, Pumpkin Pie, Apricot Appeal, Cool Caribbean. INK: Pumpkin Pie, Apricot Appeal, Cool Caribbean, Certainly Celery. ACCESSORIES: Polka Dot Ribbon, Paper Piercer and template, Signo White Uniball Gel Pen, 1/2" Circle Punch. 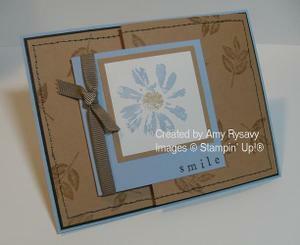 This is a little 3x3 card I've done as a Make & Take at a couple of my workshops. I *love* this flower stamp from Petal Prints - it's just so pretty. I have the guests color the stamp w/ markers (Bashful Blue and Creamy Caramel) and the word "smile" is from the Simple Sayings II set (I have them color just the 'smile' w/ a black marker). I mounted the card onto a piece of Basic Black CS that I used the slit punch on to hold the card closed. 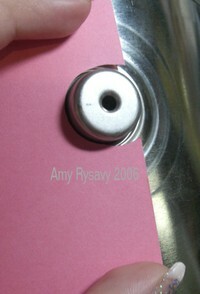 I love using them this way - you can add a "secret" message inside the 3x3 card - so neat! 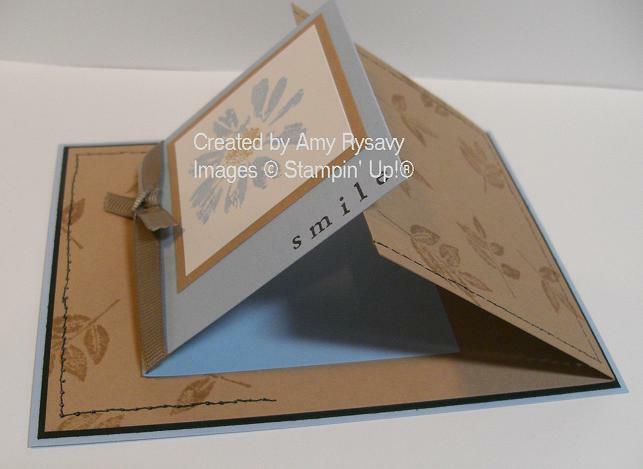 To make a card like this you only need a card base (4.25x5.5"), the large flap (4"x8.5" scored @ 3.25") and a 3x3 card (or a piece of 3"x6" CS scored @ 3"). On mine I added a layer of Black CS behind the Caramel for some added definition. SETS: Petal Prints, Simple Sayings II, Linen. CS: Whisper White, Creamy Caramel, Bashful Blue, Basic Black. INK: Creamy Caramel, Bashful Blue, Basic Black. 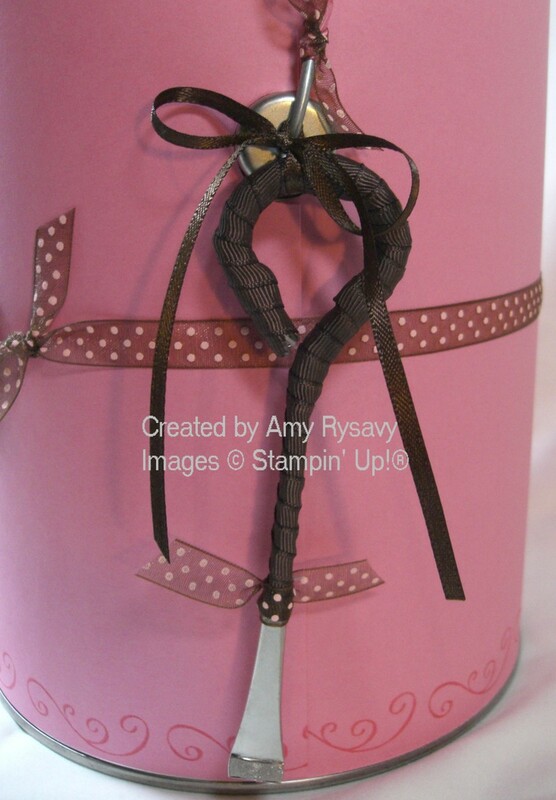 ACCESSORIES: Taupe Grosgrain Ribbon, Slit Punch, White Uniball Gel Pen, Paper Piercer. So did I get any *me* time yesterday?? Nope :o( The girls were absolute monsters and I spent the entire time getting them out of things they weren't supposed to be into and cleaning up their messes. Not to mention they were in awful moods the whole day too - so I was pretty miserable. My in-laws gave me my b-day gift last night - I got a pair of Winnie the Pooh PJ's (that are really cute and I really NEEDED new ones so I was pretty happy!) and some $$ (for stamps of course - Winter Mini pre-order here I come!! LOL). We had a couple's thing last night tho that was nice and I got a GORGEOUS card from Mary (my SU upline) that she used velvet paper on - so pretty and fuzzy - so the evening helped make up for the crappy day!! SO...once the batteries are done charging I can hopefully get a few spare minutes to upload and keep your fingers crossed that I can actually get more than 10 minutes to stamp!! I NEED to get a birthday card made for tomorrow and I have an altered paint can in the works that needs finishing ASAP too!! It's the closest thing to a *real* party that I'm gonna get and I'm glad - I *hate* being the center of attention - I try to hide behind my kids or Tim and let all the focus bounce to them LOL!! Tim made me a card and gave it to me last night - it's actually pretty good but he needs to "fix" it before he'll let me show it to y'all. Poor guy had almost NOTHING to work w/ as I was at a w/s so I had all the tools and supplies and whatnot. So it might be a day or two before everyone gets to see it but then everyone has to be super-nice and leave him lots of (GOOD) comments!! Anywho tho Happy B-day to me and if anyone out there shares this day Happy Birthday to you too! !